Hah! Good luck with this one! 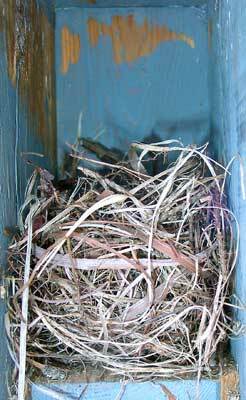 Description of nest: 3.5" high, nest cup towards back of box, 2.5" deep (cylindrical shape) and about 2" wide. Nest composed of ~99% dried grass, three 2 " long evergreen twigs, one dried evergreen leaf. One small (1") white downy feather in nest cup. Two days later, more downy feathers were added, along with one piece of faded tinsel. Nest building began the first week in June 2005. The nest was hastily constructed. Box and mount: Gilwood box mounted on 3/4" electrical conduit with a wobbling PVC baffle. 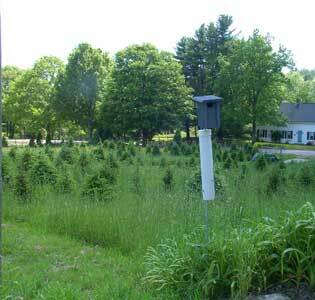 Location: Northeastern Connecticut (Zone 5), on the edge of a dirt road and a Christmas tree field in a rural area. Go HERE to see the answer. "The student of Nature wonders the more and is astonished the less, the more conversant he becomes with her operations...."
- Thomas Henry Huxley (1825-95), British biologist and educator.